Activism is most commonly associated with collective or group action by ordinary people, usually volunteers, who come together to change what they consider to be unacceptable or unfair circumstances. These individuals come together in a shared belief about the nature of the problem, and the means to best address the issue, using political opportunity structures to enable their influence on elected officials, policy makers, and institutions. Activism is also practiced by institutions and organizations, particularly in the nonprofit/nongovernmental and private sectors, as a means to apply economic, political, or moral pressures on communities, governments, and other organizations to stop specific practices or to encourage desired policies. Finally, geographers are also activists, both inside academic environments and in wider society. The focus of action has spanned the political spectrum, from exclusionary efforts aimed at protecting property rights and the status quo (e.g., community opposition to homeless shelter siting in local neighborhoods) to inclusionary actions aimed at expanding access to political power (e.g., the US Civil Rights Movement); from reformist aims (e.g., redefining legal parameters to prevent hate crimes directed at specific groups) to radical goals (e.g., overthrowing or taking over government). These foci also have varying substantive aims, from very local issue based conflicts (e.g., trying to prevent evictions of renters from housing) to national level controversies (e.g., strengthening or weakening environmental regulations). There are three primary reasons for the rising importance of activism in the twenty first century. First, governing has become less centered in formal government agencies, where the practical routines of managing political controversies, public financing, and resource allocation have moved increasingly into the realm of ordinary people, nongovernmental agencies, and private firms. Part of this trend globally is related to strong pressures from international donors and national governments for decentralizing decision making to more local levels, making communities, cities, and regions more able to make their own decisions about resource allocation, regulations, and planning for the future. Second, and related to the first trend, is the rise of civil society in public and private sector governing at the local, regional, national, and international levels. The expansion of civil society in public sector governing is due not only to the pulling back of formal government agencies in governing, but also to the increasing sense by decision makers that residents, groups, and businesses need to be involved in the design and implementation of policies to ensure their effectiveness. In the private sector, the rise of shareholder activism in corporate governance has become increasingly important since the 1980s and 1990s with the rise of large institutional investors, especially pension funds for public sector employees. And finally, activism has emerged as a challenge to larger economic and political pressures for decentralization and neoliberalism. Though the general notion of more autonomy by communities and cities by providing more responsibility for plans and policies may seem in general to be a way to make governing more responsive, there are drawbacks to this approach. The most important challenge is that resources (e.g., funding) to implement local ideas are not often transferred from central or national governments even when local responsibility is increased, and consequently, local communities and cities are being expected to use the private market, or commercial activities, as the way to deal with economic, social, and environmental challenges. The linkages between geography and activism are twofold, and can be described as (1) the geographies of activism, and (2) activist geographies. The geographies of activism consist of different examples of activism, the distinct goals of activism, and the scales of activism. 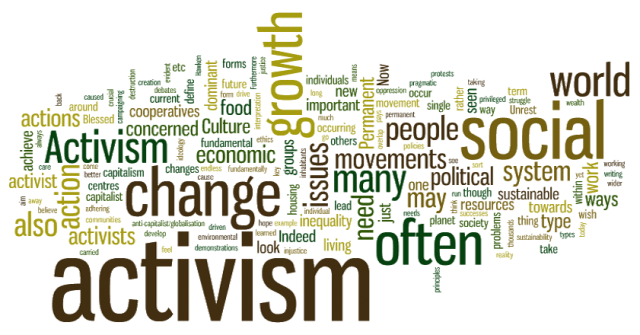 Activist geographies consider the more active links between activism and geography through research that challenges conventional ways of thinking, and through political action engaged in by geographers and other social scientists to change political practices, and social and economic systems.